Cover page to an 1882 brochure which includes the single-door Tourograph, Combination and Utility cameras. Section from the 1882 brochure describing "Tourograph Outfits." The 2-door model is not shown in this brochure, but it is interesting to see that the "packed for travel" engraving is the 2-door body pattern. 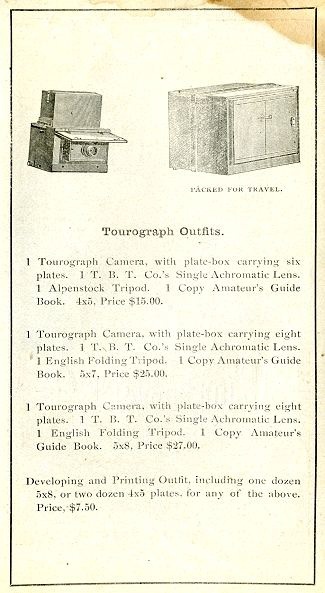 The first reference for a dry plate Tourograph (c.1880) is advertised by the Blair Tourograph Company located at No. 1 Windsor Street, Cambridge, Mass. 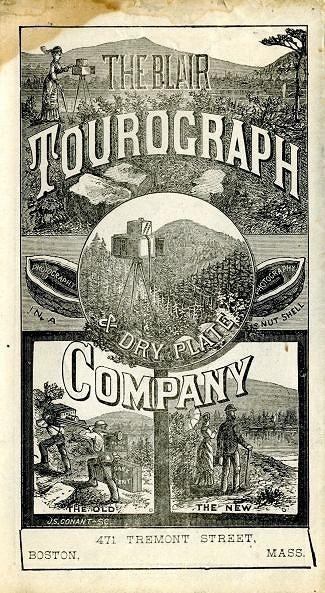 After changing the name to the Blair Tourograph & Dry Plate Company, an 1882 catalogue was published illustrating a 2-door Tourograph. Although listed at No. 292 Washington Street, Boston, Mass., the catalogue also includes an overstamp mentioning that the company has "removed to No. 471 Tremont Street" in Boston. The brochure shown on this webpage has the first appearance of the single door design and may represent an early attempt to update brochures to include the Tremont Street address. The address does not have a professional look and appears to be a last minute change. Later catalogues with the Tremont address are more professional in appearance.